‘Bundan iyisi Şam’da kayısı’, Will you trust me if I say that I speak Turkish? I know that you will not. Ok, chill. This Turkish idiom literally means “the only thing better than this is an apricot in Damascus” and the most simple meaning is “it doesn’t get any better than this.” That is the excellence of Apricots. The seed kernels are the source of its rich essential oil and are also called as apricot almonds or bitter almonds, attributed to its bitter taste but the sweetest healing benefits that would coerce you to love it forever. Often associated with ‘education and medicine’ by the Traditional Chinese, Apricot means ‘education circle’ in the Chinese dictionary. Held high as a phenomenal natural remedy for cancer, Apricot kernel is the most talked about subject matter in the world of medicinal research for its effectiveness in treating malignant growths in mankind. 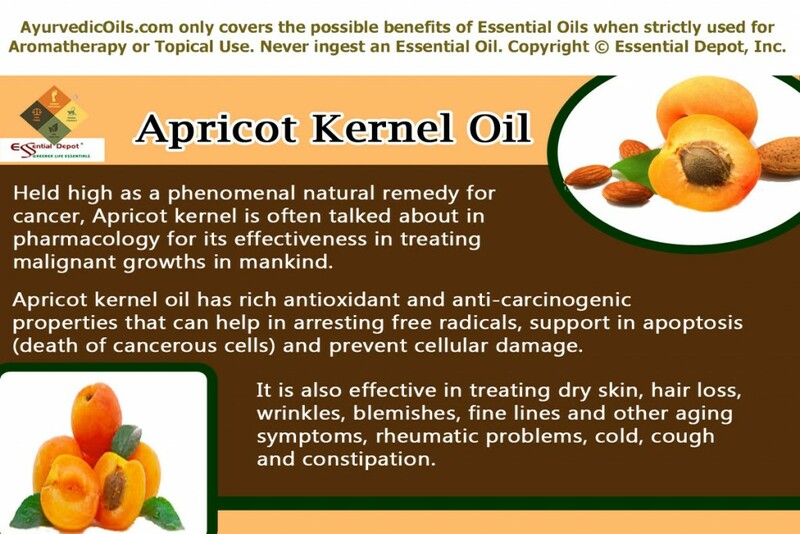 Apricot kernel and its essential oil have been in various Complementary and Traditional Healing systems including Ayurveda for its enormous therapeutic benefits for treating dry skin, hair loss, wrinkles, blemishes, fine lines and other aging symptoms, rheumatic problems, cold, cough and constipation. Apricots are scientifically called as Prunus armeniaca. This drupe fruit is indigenous to Armenia, Himalayas, China and few other parts of Asia. Certain sources also state that Apricot was first cultivated before 3000 BC in India. The Roman General Lucullus imported Apricot initially to Rome from Armenia. The historical hero Alexander the Great was the first king to bring in Apricots to Greece. Chinese and Apricots have a historical bonding, where the renowned Chinese physician Dong Feng of the ‘Three Kingdoms Period’ just requested his patients to plant Apricot plants in his orchard on the recovery of their sickness as a token of gratitude for his medical services. This eventually ended up in the growth of numerous Apricot trees along with innumerable medicinal benefits in Dong Feng’s garden. It is also said that Confucius, the Chinese philosopher taught his students in a place encircled with Apricot woods. Even today, the poetic indication to physicians in China goes like “The Expert of the Apricot Grove.” Wonderful to hear, isn’t it?!?! The woods of the Apricot trees are also used in various wooden carvings in Armenia and the musical wind instrument named Duduk is known as the Apricot pipe. Regarded as an aphrodisiac in Europe, Apricots have also been mentioned in “A Midsummer Night’s Dream by William Shakespeare and as a stimulant of normal labour in “The Duchess of Malfi” by John Webster. The traditional use of Apricot seeds include its effectiveness as a natural alternative for cancer cure and these seeds were used as early as 502 AD for fighting against tumors. In the 17th century the English used the seeds of Apricot fruits in the treatment of ulcers, tumors and swellings. Apricot kernels were prescribed in Chinese medicine for treating emphysema, asthma, bronchitis and other respiratory conditions. Throughout the history, these bundles of wonders have been in use for treating constipation, cough, expelling mucous and phlegm deposits and for enhancing the health of hair and skin. Sir Robert McCarrison during his job with the Indian Medical Service in 1930s, explored the health and heartiness of a tribal populace known as Hunzas. Major Robert said that the people of this tribe lived for about 100 years of age mainly due to their nutritious diet with fresh grains, fruits and vegetables, raw milk along with their livelihood that involves lot of natural physical exercises. It was also written that there was no evidence of cancer, obesity, heart problems or diabetes. The reason behind their cancer-free life was later found by Krebs research, which concluded that Apricot kernels were a vital part of the Hunzas diet regimen, contributing to the discovery of the amygdalin compound in Apricot kernels, the secret behind tumor suppression. The seeds of Apricots and its essential oil have been used in the manufacturing of perfumes, moisturizing lotions, soaps, cosmetics and in confectioneries as a substitute for bitter almond oil in seasoning culinary varieties. Antioxidant, expectorant, laxative, anti-inflammatory, moisturizing, anti-asthmatic, revitalizing and anti-tussive are the prominent healing values of Apricot kernel oil. 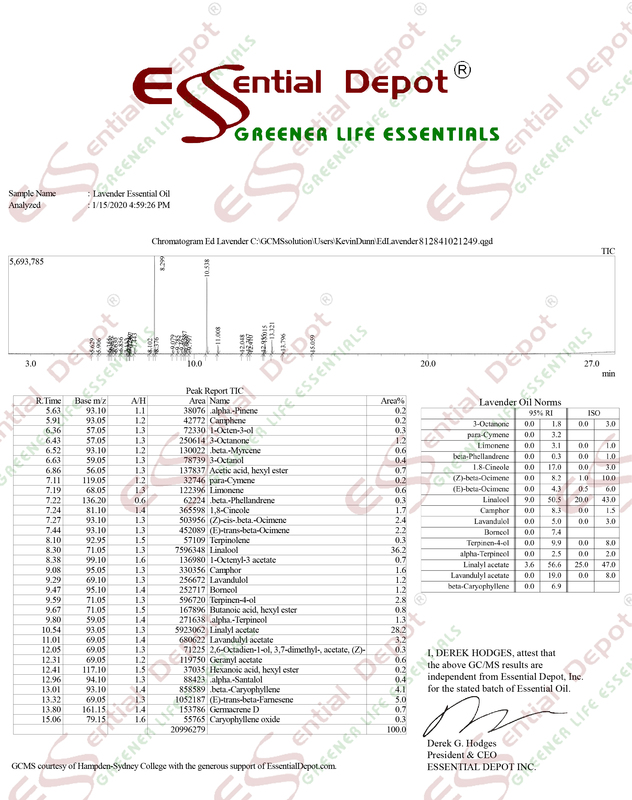 The chemical constituents of this oil are oleic acid, linoleic acid, stearic acid, palmitic acid, palmitoleic acid and arachidonic acid in the order of its major presence. It also contains amygdalin or laetrile, the crystalline compound claimed to be responsible for its cancer fighting attributes. Apricot kernels are indeed a nutrient hub with the presence of Vitamins A, C, E, K, B17, phosphorous, niacin, magnesium, potassium, manganese and copper. Being the oldest remedial system (about 5,000 years old), Ayurveda is adorably called as the Mother of all healing sciences on earth. As a sacred child of India, Ayurveda is believed as a gift to Acharya Dhanvantari, the Lord of Medicine by Lord Brahma, the God of Creation. The aim of Ayurveda is to gift mankind with absolute health, harmony, prevention of illnesses, healthy aging and longevity with the use of natural remedies including Ayurvedic therapies and a disciplined living. It’s an ancient adage that the solutions for all the problems are deeply vested within the problem itself. With this principle in mind, Ayurveda states that illness is being in disharmony with nature and the remedies for diseases are enormously present in nature by itself. Ayurvedic encyclopedias, namely Charaka Samhita, Sushruta Samhita and Ashtanga Hridaya Samhita by the Ayurvedic philosophers and physicians Charaka and Sushruta talk about all kinds of medical conditions, their symptoms, root cause and remedies. They never stopped with fever, cold, indigestion, headache and joint pain; instead they were the pioneers of plastic surgery and C-section delivery before thousands of years that lacked both the contemporary techniques and modern medical equipment. Ayurveda defines that all things on earth including human beings are a vital part of nature and are built up with the five fundamental elements of nature. They are earth, water, space, air and fire. Human body represents these elements where bones and muscles are the components of earth, blood and other fluids – water, heat and the essential energy – fire, breathing mechanism – air and the spirit is the element of space. Each and every individual is a distinct part of nature with a unique individual constitution called as Prakriti, which is a combination of 3 doshas (vata, pitta and kapha). Perfect balance between the doshas indicate health and imbalance due to irregular food habits, sedentary life style, improper code of conduct, climatic changes etc, lead to illnesses. Ayurvedic remedies including herbs, essential oils, meditation, Pranayama (balanced breathing), Panchakarma (detox technique), Ayurvedic routine, prayers, Abhyanga or Ayurvedic massage and other natural techniques are prescribed for striking balance between doshas thus paving way for harmony with nature. The article on ‘Apricot seeds kill cancer cells without side effects’ posted in Natural news talks about the effectiveness of the amygdalin compound in Apricot kernels for fighting against free radicals and combating the growth of cancerous cells. An intense research study by Dr. Ernst Krebb, led to the discovery of Amygdalin or the B17 compound found in Apricot kernels and in about 1200 edible plant varieties throughout nature. Dr. Krebb also recorded in his study that amygdalin is a nitrioloside that bear a resemblance to the B complex structures. It is because of this reason; Amygdalin compound was named as B17. The antioxidant property of Apricot kernel oil is due to the presence of B17 and laetrile (the resultant of amygdalin when purified and put in a concentrated form). Dr. Krebb tested the positive effects of laetrile on himself and concluded that laetrile extracted from amygdalin is extremely powerful in fighting against cancerous cells and preventing further cellular damage. This research is still under various controversies due to the fact that benzaldehyde and cyanide. Numerous foods like spinach, millet, bitter almonds, lima beans, bamboo shoots contain cyanide and are still safe for consumption. This is due to the fact that cyanide molecule in these items remain ‘locked’ and are not harmful for the system when they meet up with other molecular substances. Unlike normal cells, the cancerous cells contain beta-glucosidase, which is the ‘unlocking enzyme’ for benzaldehyde and cyanide in amygdalin compounds of Apricot kernel oil. This reacts and destroys the cancerous cells and the presence of rhodanese enzymes in the normal cells prevent other normal cells from being affected by the otherwise reaction of cyanide and benzaldehyde. The best possible means to use Apricot kernel oil for fighting cancerous growths is to use it in a promising massage blend. Mix 5 ounce of Apricot kernel oil with 5 drops of Clove oil bud oil, 5 drops of Garlic oil and 5 drops of Juniper berry oil and massage it gently on your system, once in a week. Garlic, Clove, and Juniper berry oil along with Apricot kernel oil have rich antioxidant and anti-carcinogenic properties that can help in arresting free radicals, support in apoptosis (death of cancerous cells) and prevent cellular damage. You can also add 1 drop of each of these oils in diffuser during Pranayama (breathing exercise) where most of the toxic remains in the system can be eliminated through exhalation along with the positive therapeutic properties of this oil blend. The oil of Apricot kernel is light, gentle and non-sticky, with these attributes, it has established a prominent throne in the empire of skin care products. This oil helps in moisturizing the skin in case of dry, rough and scaly conditions (emollient properties); heal cuts, wounds, sunburn, psoriasis, eczema and razor burns (antiseptic properties); protect the wounds from getting infectious (antibacterial properties); fight against fine lines, wrinkles and other symptoms of aging (antioxidant and anti-aging properties). For locking in extra moisture in your skin surface and for treating acne, blend 2 drops of Rosemary oil with 2 drops of Tea tree oil and 2 ounce of Apricot kernel oil and gently work on your skin. Apricot kernel oil has a rich content of vitamin E, A and C, which are extremely beneficial for treating dry, mature, scaly and sensitive skin. Apricot oil has the potent to penetrate deeply into the skin and repair the damaged skin cells from within. Regular massaging with this nourishing blend supports in retaining the clarity, elasticity, suppleness and all other signs of a healthy skin. Dandruff, dry hair, excessive hair loss and itchy scalp are the most sickening hair problems. These conditions are caused by lack of nutrition, unhealthful lifestyle practices, damage due to external factors and excessive use of chemical hair care products with concentration of sulphate and paraben. Apricot kernel oil comes to your rescue with a high content of vitamin E and other fatty acids in treating all types of hair problems with its potent to lock moisture in your scalp and hair. Massage your hair and scalp with 5 ounce of Apricot kernel oil with 5 drops of Curry leaf oil and 5 drops of Ylang Ylang oil for combating dandruff, dry and itchy scalp, split-ends, premature graying and promote hair growth by deeply penetrating the scalp and nourishing the hair follicles. You can also add 5 drops of Apricot oil and 2 drops of Curry leaf oil in your mild shampoo and conditioner for adding that extra shine and bounce to your lustrous locks. 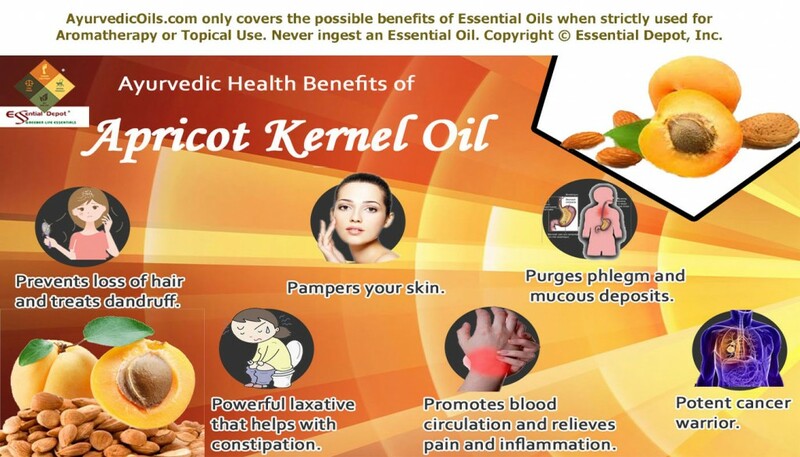 Apricot kernel oil is a part of the Traditional Chinese Medicine for inducing diarrhea, especially for discarding toxic remains in the body through metabolic wastes. This oil has exceptional laxative properties that help in treating constipation, where passing hard and bleeding stools ends up in excruciating pain. Gently massage your abdomen with 6 drops of Apricot oil and 2 drops of Peppermint oil for encouraging regular bowel movements, secretion of bile and other digestive enzymes for trouble-free digestion and excretion. The oil extracted from Apricot kernels has proven anti-inflammatory and pain-relieving properties that aid in relieving pain and inflammation, especially in the joints. Massaging the affected parts with 5 ounce of Apricot kernel oil and 2 drops of St. John’s Wort oil, 2 drops of Cedarwood oil and 6 drops of Ajowan oil can assist in alleviating stress and pain, strengthening the system, promoting blood circulation and eliminating toxic deposits through urine and sweat. You can also follow this massage with heat pack for allowing deeper penetration into the skin cells. This aids in opening and enhancing the flow of prana or vital energy, harmonizing the nervous functions and for granting a sense of complete relief. Ayurveda states that cold, congestion, arthritis, rheumatism and other inflammatory conditions are a result of amassing of toxins, salt, uric acid and fat deposits in the system. In general, fluid retention disorders are caused due to kapha vitiation and with its power to pacify excess kapha; Apricot kernel oil helps in treating such inflammatory health conditions. These heart-shaped tiny little seeds are used in various traditional medicines including the Chinese medicine for treating respiratory conditions like asthma, emphysema, cold and bronchitis. With its antitussive (cough suppressant), expectorant and anti-asthmatic properties, Apricot kernel oil can help in eliminating phlegm and mucous in the lungs and respiratory passages, alleviate cold, cough and congestion and support in problem-free breathing by lessening strain on the lungs, when 4 drops of Apricot kernel oil with 2 drops of Peppermint oil and 2 drops of Black pepper oil is added to steam inhalation and a gentle massage on your back, temples, chest and throat with your vaporizing ointment mixed with this blend is given. Apricot kernel oil is also used in the treatment of anemia, fever, lowering cholesterol for heart health, osteoporosis and earaches. This article is only for the purpose of information and is not for treatment of any health conditions or for substituting any prescription medicines or the advice of your medical professional. We are not healthcare experts and this piece of information is shared only in public concern for passing on the traditional healing wisdom of Ayurveda. 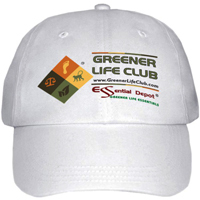 Never take essential oils internally and it is recommended only for topical application. This is because 100 percent pure and organic oils are highly concentrated substances and may cause allergic or harmful reactions, if ingested or used on the skin directly. Always speak with your Ayurvedic professional or healthcare practitioner before choosing the right essential oils for your unique individual constitution and medical condition. Extra care should be taken in using essential oils if it is for children, nursing and pregnant women. “Anyone can count the seeds in an apple. No one can count the apples in a seed.” -Author Unknown.